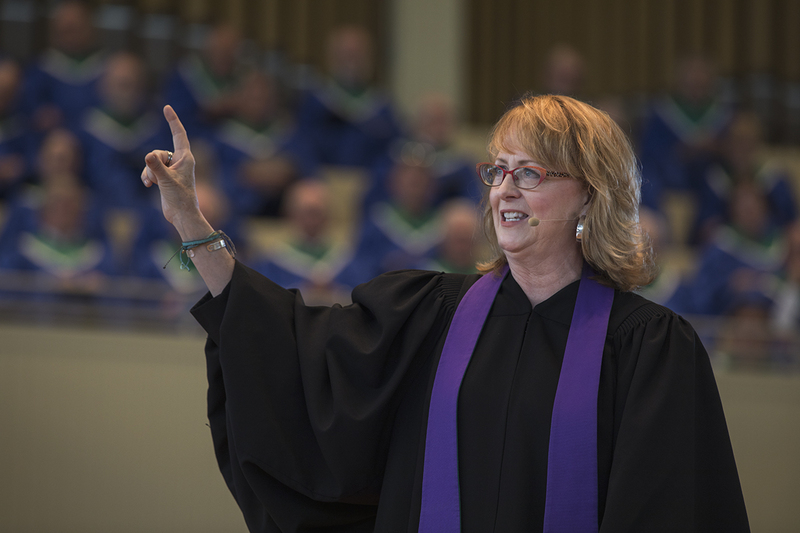 Her sermon title was “The Mulch Pile,” and the theme was letting go. The Scripture reading was Colossians 3:1-2, 8-14. Sparks said she and her husband were traveling across the country, and to the west of Minneapolis they saw a billboard that had a picture of a casket “Minnesota Cremation Society — Think Outside the Box,” it read. “That is what humor does — helps you think outside the box, see in fresh ways, and it builds community and bridges,” Sparks said. Sparks quoted theologian Karl Barth, saying that humor is the closest thing we have to God’s grace. Sparks recently ended a three-month sabbatical. For the first month, she and her husband rode their Harleys around the country. “That’s right, you have a biker chick and a comedian for a chaplain this week,” she said. The second two months they spent in their cabin in Wisconsin — a place they visit regularly. It is near a town much like Garrison Keillor’s Lake Wobegon: 2,000 people and 17 Lutheran churches. They have a ritual for their first morning — first, making “really bad coffee,” and then fishing for bluegills and other small fish and then cooking breakfast. During one visit, they threw the fish guts and egg shells into the trash after breakfast and went out to run errands. They had no air conditioning and the day was 93 degrees — “you can see where this is going,” Sparks said. When they got home, they were hit with the smell. In the Scripture reading, Paul tells the Colossians to get rid of their anger and malice and clothe themselves in a new self. 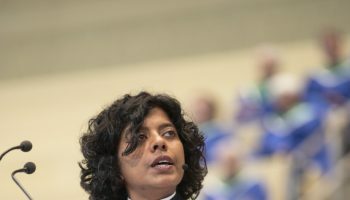 This is the arc for the week in her sermons: to look at what the trash is that needs to be put out on the mulch pile and, on Friday, to sum up what beautiful new thing might grow in its place. Sparks said that sometimes when we are in denial, we don’t know that we are carrying trash or we have lived with generations of disregard for the problems. As an example, she said she threw her back out once and had to lie on the floor for almost a week. On the fourth day, after having read every newspaper and magazine in the house and binge-watched reruns of “Dr. Phil,” she was bored and her only view was under the furniture. The second action in taking out the trash is letting go, and that is easier said than done. There are many things that we are used to but are useless to us. “My father had a big old Buick boat of a car and he kept two spare tires, food, water, blankets and a foil space blanket in his trunk — in case there was a blizzard — to drive the 0.1 mile to from our house to his office in Charlotte, North Carolina,” she said. It can be hard to let go, but if we carry this trash too long it begins to define us. Ralph Waldo Emerson said what we worship, we become. For instance, she said, we have to throw out our judgmentalism of others in order for mercy, empathy and forgiveness to grow. 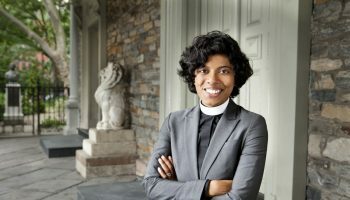 “We judge people by the craziest things, like color, language or religion that have nothing to do with their being a child of God and our brother and sister,” she said. She told a story from Jack Kornfield about two prisoners of war. The first one asked the second if he had forgiven their captors. The second one said no. “Then they still have you in prison,” the first one replied. The Rev. Robert M. Franklin Jr., director of the Department of Religion, presided. Filmmaker and lifelong Chautauquan Daniel Karslake read the Scripture. 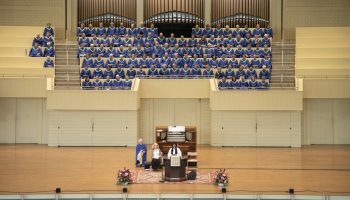 The Sunday service was the baccalaureate for the Chautauqua Literary and Scientific Circle Class of 2017, whose motto is “Read, Dream, Discover.” Virginia Oram served as cantor for Responsorial Psalm 116, “The Name of God,” setting by David Haas. The hymn-anthem was “What Gift Can We Bring?” by Jane Marshall, arranged by Benjamin Harlan. The Chautauqua Choir sang “O Praise the Lord, All Ye Nations,” by Amy (Mrs. H. H. A.) Beach, under the direction of Jared Jacobsen, organist and coordinator of worship and sacred music. 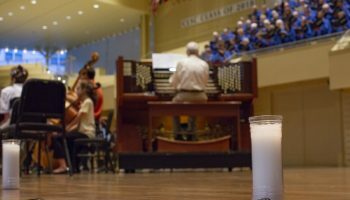 The offertory music was “He Comes to Us as One Unknown,” by Jane Marshall, using words from Albert Schweitzer’s The Quest for the Historical Jesus and words by Philipp Nicolai, translated by Catherine Winkworth. The organ postlude was “Litanies” by Jehan Alain. The Jane Robb Shaw Hirsch Endowment and the Edmond E. Robb-Walter C. Shaw Fund provide support for this week’s services.